Just over one year ago, we launched this website.We had no idea what we were getting into, really. We had only read a couple of other travel blogs previously, and we thought maybe it could help us make a few extra pennies while we traveled. A month into it, we started to realize the enormity of what we had stumbled into. We got caught up in a wave of social media madness, became obsessed with our statistics, and found out that there is a crazy community of travel bloggers that span the globe. We wrote a post (the original ‘Confessions’) about our initial frustrations with it all. It was really written for ourselves, to vent about our initial struggles and to also somewhat set a mission statement for our blog – what we would write about and what we would avoid. We were overwhelmed with the comments that supported that post, and it really helped us forge some positive connections with others. And then suddenly, it’s a year later. This venture has definitely strengthened our relationship and made us believe we are capable of just about anything we set our minds to. 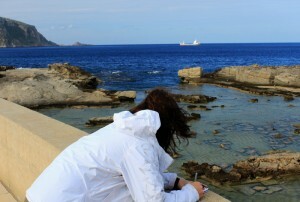 Pulled over to write down blog ideas in Sicily. — We no longer travel the same way. I can’t remember what it’s like to be exploring a new destination without thinking about how I would write about it. Where I wasn’t on a tour without a notebook in hand, or obsessed with getting the *perfect* photo, or even what else Pete and I used to talk about over dinner other than editing photos and the order of upcoming posts. Sometimes I wish for simpler travel days, but I’m not sure at this point I could turn off that part of my brain anyways. — We’ve made mistakes (and we’ll most definitely make more). There were several times when I hit the publish button while muttering, “Eh, it’s good enough.” While that practice may not be entirely avoidable, it is painful each time I do it. The entire year has been an endless learning process – we have uncovered some valuable lessons on what we’re capable of when it comes to travel and writing. The hard part, however, is putting those into practice. 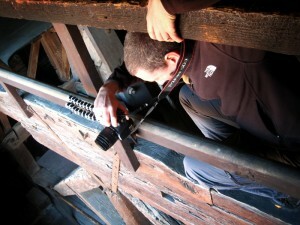 Pete balancing on a beam to get the perfect shot from a bell tower high above Bologna. — But we feel like we now have a purpose. It is easy to lose focus in long term travel, and wonder what it’s really all for. Now we have jobs to do. And even though they don’t pay much, they get more effort from us than any jobs have before. Perhaps because we love them. — The best part? We’re doing it together. 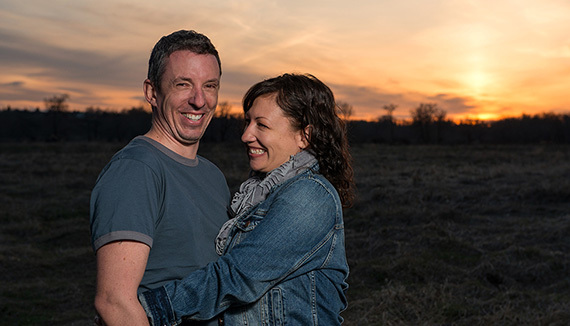 Sure, being in business with your spouse can be difficult at times (and we have our trying days, BELIEVE ME), but we’ve fallen into roles we are pretty comfortable with. We love talking new ideas and are great at giving each other honest opinions and support. This venture has definitely strengthened our relationship and made us believe we are capable of just about anything we set our minds to. — And, about the pay…well, it is awfully low. With a very rough estimate of time spent on the website, I figure that we each made a whopping $3.26 per hour for all our efforts (not including actual travel/research time!) The last time I was paid this little was when I babysat my dear Uncle Calvin‘s three kids as a teenager. But it is actually far more than I expected to earn our first year, like $3.26/hour more, so I am really not complaining. The truth is that we would be continuing our efforts even if we made nothing, so it really is all gravy. Our definition of success for this blog has never included monetary goals, and it will stay that way. — Much more important are the incredible opportunities that have come along. Connections for housesitting jobs were forged, new places were explored, and new friends were made. 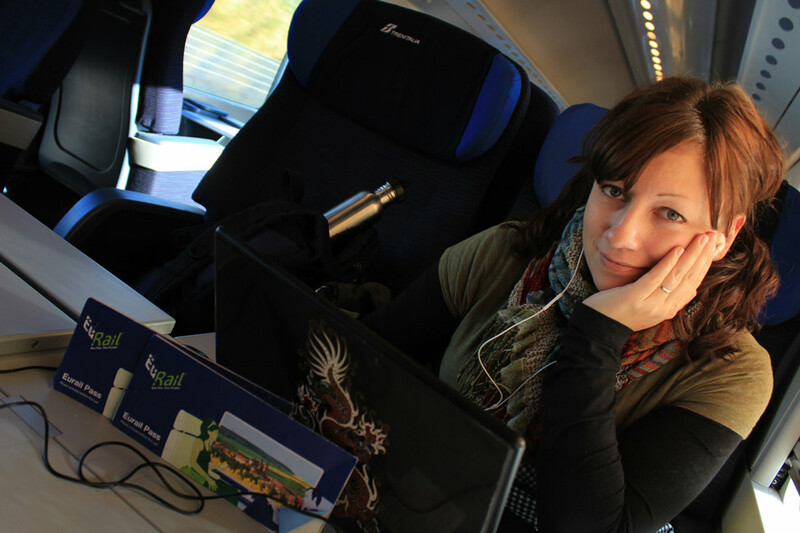 Traveling through Croatia, Slovenia and Italy by train would not have been done without this little website. And thus, the opportunity to *maybe* see our crazy curling dreams come true wouldn’t be upon us. In the whirlwind of this year, we’ve tried desperately to stay true to our mission set out in the original confessions, and I’m proud that we have largely done that. We refuse to pretend to be anything we’re not – we won’t “buy” Facebook fans like we’ve seen others do, we don’t even give many travel tips as we admit we are not the best travelers. We also aren’t scared to tell you when we don’t like a particular place, even though we always lose fans when posting those truths. We just like to tell stories. That’s all. And thanks to our recent reader survey, this appears to be what people come back for. — We’re going to slow back down. Our European adventure has been amazing, but we’ve suffered some serious burn-out from moving too fast. A few of our readers from the survey also mentioned that they prefer our more in-depth stories when we stay in one place. And you know what? We do too. Taking postcard pictures of popular destinations has been great, but we love to sit still and get to understand the people and the culture much better. — Pete is considering an “overhaul/makeover/mohican” and I am going to “wear the green shirt more”. We take our reader feedback VERY seriously! It’s been a helluva crazy year, and we’re excited to see what round two brings! Thanks to everyone who has been so supportive! Im just starting out and both this post, and the first part are a good read. PLease check out my blog and let me know what ya think. I hadn’t ever looked into house sitting as a means to indefinitely travel, but it seems you two are authorities on it. Very cool! Alright, so a year later, a lot wiser, and now here’s to more adventure! Thanks David! Housesitting allows us to even live on $3.26/hour sometimes, which is one of the reasons why we love it! ‘Tis true! We have been able to live a couple of very cheap months and come out in the black. I have very much enjoyed perusing your blog today! Your adventure is somewhat similar to mine – I just left the corporate world to start the life of a nomadic photographer earlier this year. My blog is primarily a photography blog but I am starting to work in some travel type stuff as well. I really like the look of your site as well. I know you said you are considering an overhaul, but it is really well done as is. It is clean an easy to navigate. I just added you to my rss feed reader and am looking forward to reading more of your stories. I have to wholeheartedly agree with Anne…. your site has inspired me to start blogging and I find it PERFECT for navigation and the ease of reading…it’s going to be difficult to make changes for the better…but am sure you will. Keep up all the good work. What are you medium to long term plans then? Will you travel until your happen across an idealic and realistic place to settle? You certainly are the envy to a lot of people I talk to about you guys which I can understand as they’re all doing the job and mortgage thing whereas you’ve both let go of the anchor and sailing through freedom. Lots of love and hugs from Ljubljana, Slovenia! Thanks Sean! We really have no medium to long term plans. The only possibility right now is if our “crazy curling dreams” turn out, we will likely be in your beautiful city again in the fall! Otherwise, we really don’t know. This nomadic lifestyle is so fulfilling (and, cheaper then being settled), so we’ll likely keep it up as long as possible! I totally didn’t realize that we were allowed to vote on what you’ll be wearing next year. I’m totally keeping that in mind for next years survey. Congratulations on your 1st year of entertaining posts. Looking forward to whatever you decide to do next year. Haha, perhaps I shouldn’t have shared that little piece of info! Too bad that the green shirt is getting holes in it, time to replenish the wardrobe soon! Wonderful, interesting read. Onwards & upwards you two. I so enjoy this blog, I always get what I want when I come here, which is a good story and a little insight into wherever you happen to be. Keep it up you two, you definitely have the gift of storytelling and humor. Great post guys – good to hear that you’re sticking to your guns, 2012 is gonna be a big year for you two! And SERIOUSLY, are you still fighting about that logo?! Haha. It’s crazy what can happen in just a year, isn’t it? I’m glad you guys have stayed true to yourselves throughout it all. I think that’s one of the reasons yours is one of my favorite travel blogs to follow. Congratulations on your 1 year anniversary! We travelled for a year before we started our blog and have now been going for nearly two years as bloggers/nomads, and you are right -it changes everything! The bad side is that getting away from the internet is tough and you can never switch off thinking like a blogger. The good side is that blogging has led to so many amazing experiences and friendships, and I like that it makes us learn more about a place so we can write about it. Here’s to your successful second year! That is one positive for sure Erin I should have mentioned – I love learning about new places, and this really opens us up to that. We took so many walking tours with locals on our Eurail adventure and even though I spent a lot of time furiously taking notes, it was so much more interesting too. And you hit the nail on the head with not being able to switch off thinking. We just finished a 5 day yoga retreat/tech detox (first post on it coming Monday) and it was a real struggle for me to quiet my mind so I could get the most out of it. 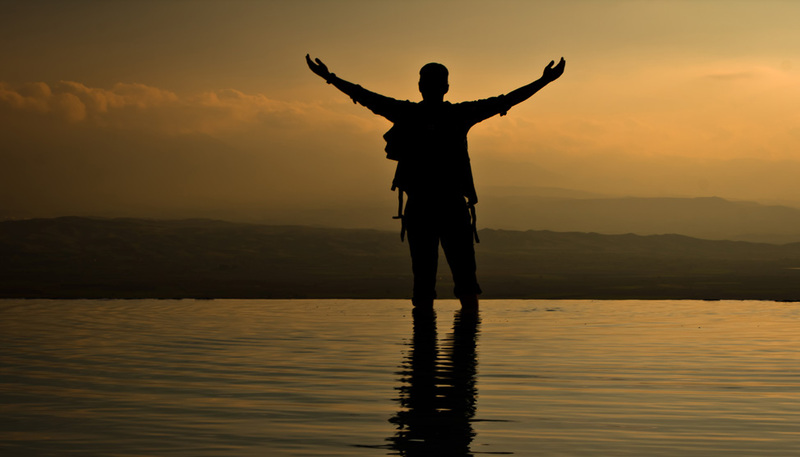 Travel blogs are about the personal. As long as you’re you then we’ll all keep coming to read. Good luck! That it does Alison, which is why we’ve mostly stayed on the outside where it’s still rosy and wonderful – haha! It was really great to meet you guys too in delicious Brussels!! Ha.. so I just read that you were in Brussels.. glad that you enjoyed ! You two have quickly turned into superstars in this little blogging world… well done…keep having fun! Hey guys – thanks so much! We are always honored to be included on any list, and pleasantly surprised! Congrats to one year of travel! We just atsrted our RTW last week and I cannot wait to see where we will be (physically and mentally) in a year. Thanks for sharing! 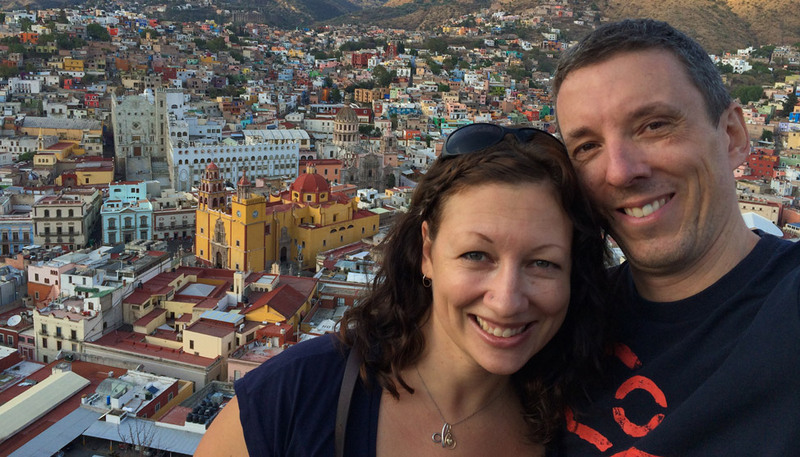 Oh, we’ve actually been traveling for 2.5 years, just seriously blogging for one! Congrats on starting your travels, you will undoubtedly be a different person in a year! Love that you’re planning things out and trying to figure out what you want! I’m with you on the “can’t go anywhere without thinking about how to write it” part. As we cycled from Alaska to Argentina, I was constantly thinking about how I could describe the scenery, or make the people we met come alive through words. Although that does detract from the overall experience in some ways, in others it enhances it as you’re paying attention to details you wouldn’t otherwise. Good to hear you’ll be hanging out with the rest of us! I agree so much Nancy – that it does make me pay attention to more details. Problem with my crap memory is that if I don’t stop and write it down right away, it’s gone! That would be a problem if I was always on a bike – haha! You will be in Umbria?? I so wish I could be in Umbria! I will be at TBEX this summer though. Enjoy! Thanks for sharing your thoughts and plans. I can totally relate to much of what you’ve said. I need to take a little time to evaluate and plan — very soon. Look forward to more of Hecktic Travels. Thanks so much Cathy! I find planning such a hard thing to do now…and I used to be such a crazy planner. I like the freedom, but am also very psyched for the great housesitting jobs we have lined up. Very true. My wife and I have jumped in to this crazy manic pool of bloggers on the go. Completely hear you about the idea that you can’t turn off the writing mind when you revel as a writer. I seem to write in my head most of the day conciously or not. Some travel blogs seem to just pound on twitter like its a slab off meat. We are trying to add value an avoiding turning into another tweet bot. Thanks for the honest perspective. It is very cool – we’ve managed to meet quite a few on our travels and are happy to call them friends! And I’m sure we’ll get to meet many more in Umbria this spring. I think I made $3.27 an hour. In your face Heckeses! Looking forward to another year of the Hecks!! Raymond @ Man On The Lam recently posted..What exactly is ATF 2012? Thanks Jade, we did have some writing online before this (but not for mass consumption even though it’s still there! ), but it was just over a year ago that we started to take it seriously! Congrats on a great first year. I’m looking forward to all the upcoming great content! Well-written honest post. I thoroughly enjoyed reading it. We feel so in sync with you guys & your journey- ours is very similar. Thanks so much for your tips and encouragement. Just found your blog, LOVE it! … I traveled through Europe for 6 months and blogged just for fun, then realized that I was taking mental notes about what I was going to blog about that night and saw that I had crossed the line from casual blogger to I am SERIOUS about this blogger! It sneaks up on you. I also love a good story, so I’m looking forward to following your adventures now that I’m back in Vancouver. Don’t know why I only just discovered your blog, but I’m so happy I did! I can really relate to your writing and the way you both approach travel and creating a business out of it. As a (very) fledgling travel blogger myself, I really understand the idea of staying on the outskirts….no matter what it’s about, it seems any community is going to have its own politics and competition. But interacting with and meeting those people that you honestly connect with can be so rewarding. I hope we get a chance to interact in the future. Thank you for your blog…can’t wait to dig my teeth into it (just soft little nibble, I promise). Cheers! Hi Heather, nice to hear from you, glad that this post resonated. After actually attending one of the travel blog conferences, I was happy to come home with many new friends, great industry contacts, but also importantly, a good idea of who or what to stay clear of as well. I still like to stay on the outskirts, but now I have a few good friends on the ‘in’ as well! 🙂 Good luck with your blog, and I hope we cross paths as well! Cheers.